Stylish actors Timothée Chalamet, Donald Glover, and Nick Robinson are into brown pants right now, and are doing an excellent job of showcasing their appeal. Big-ticket items like jackets and shoes tend to steal the style spotlight. But remember this: pants can tank—or make—an outfit. So if you’re still wearing your standard-issue jeans and khakis with every sock sneaker and leather jacket in your closet, you’re doing it wrong. It’s time to invest in some pants that some personality of their own. The good news is that we're living in a veritable Golden Age of pants, so there’s no one right way to upgrade your game. Wide-leg chinos, side-stripe pants, and pleated pants are all having a moment right now. Another stellar option? Make like UPS, and ask what brown can do for you. Wear 'em with a crease down the front, and a hem short enough to see a little sock—or when the weather finally warms up, some ankle. 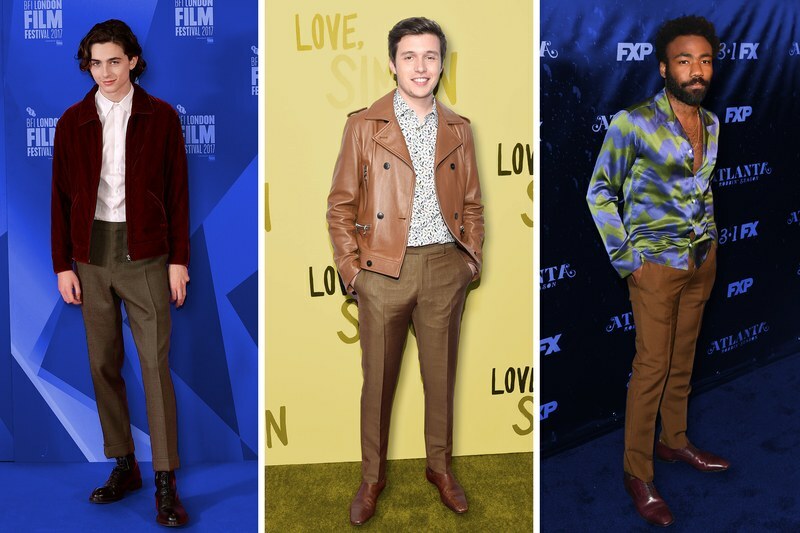 Stylish young actors Timothée Chalamet, Donald Glover, and most recently, Nick Robinson of Love, Simon, are all about brown pants right now, and make a seriously compelling case for the style. As you can see in the above photo, these pants make every outfit 10% more American Gigolo. Sure, the late ‘70s vibes are heightened when you’re wearing a silk shirt unbuttoned halfway, as Glover did recently, or a matching brown leather jacket and dress shoes, as Robinson did. But, as Chalamet demonstrates, they can work with other genres of clothing too, adding a little bit of retro flavor to any vibe. Imagine any of these looks with a simple pair of dark skinny jeans. Are they half as cool? Half as flattering? Half as "I'm about to blow up"? Not even a little bit.